Veterans for Peace Gainesville announces its 7th Annual Alachua County Peace Poetry Contest, where all students, grades K–12, are encouraged to submit one original poem focusing on the idea of peace and social justice. The deadline for submitting a poem to the contest is March 21. 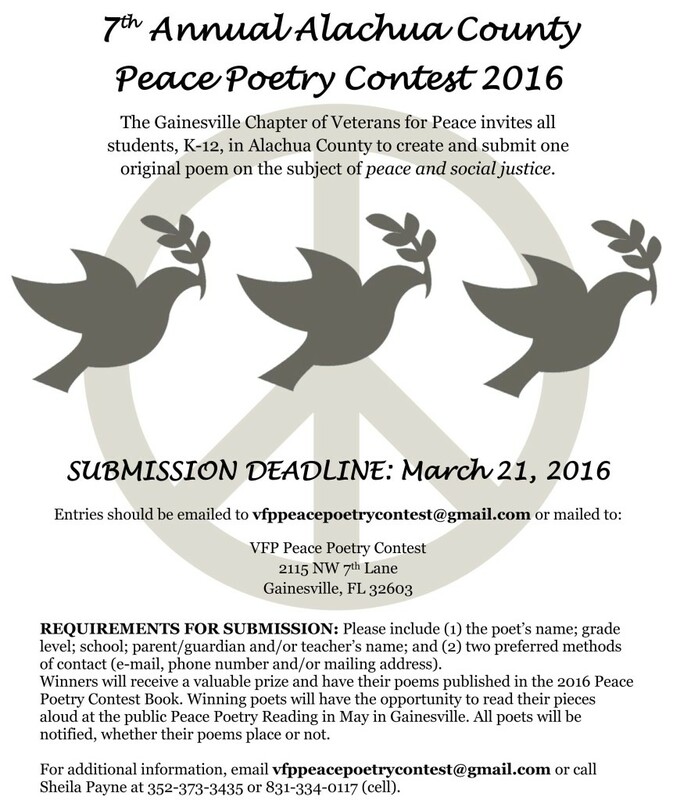 Gainesville Veterans for Peace Chapter 14 announces its annual Peace Scholarships for the spring of 2016. We are awarding two scholarships of $500 for high school seniors or college students with demonstrated commitment and leadership in activities involving peace & social justice, conflict resolution, and/or nonviolent social change. Deadline for application is April 15. Members of Gainesville Veterans for Peace pose with Col. Ann Wright at the National Vets for Peace Conference in Miami in August. Photo courtesy of Gainesville Veterans for Peace. 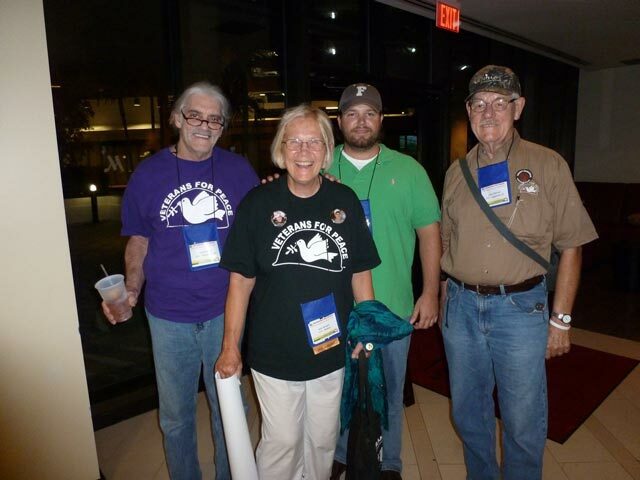 Veterans for Peace (VFP) held its 27th national convention this year in Miami. The focus was on U.S. military involvement in Latin America with the theme “Liberating the Americas: Lessons from Latin America and the Caribbean.” Speakers included author Alice Walker, Father Roy Bourgeois and TV host Phil Donahue. Also speaking at the workshops were familiar names like Col. Ann Wright, David Swanson, Medea Benjamin, Iraq War resisters Camilo Mejia and Victor Agosto, Carlos and Melida Arredondo, Marlene Bastien and DeAnne Graham. They participated in presentations on Haiti, Honduras, Guatemala, a panel on G.I. resistance, a Hiroshima/Nagasaki commemoration and much more. You can see video of the workshops at vfpnationalconvention.org. We met with many other members to discuss current issues including drone warfare, depleted uranium, Agent Orange, the military industrial complex, the war on drugs and U.S. foreign policy in South America. Many of the members present in Miami worked together in the ‘80s. In Central America, VFP visited Nicaragua, Guatemala and Honduras. VFP was invited back to help monitor the elections of 1990. While older members of the organization were excited to reunite and have some laughs, newer members and guests were eager to meet some of these legendary characters who have devoted their lives to working for peace over the past decades. With an increasingly corporate-controlled government that seems to have little regard for the views and desires of the American people, it’s easy to feel helpless and voiceless. Dreams of a peaceful world quickly become mere illusions.